Our Blessings and Congratulations to Ruth Lindstedt, validly ordained a Roman Catholic priest today with Roman Catholic Women Priests in St. Cloud, Minnesota!! Below is an excellent article by Stephanie Dickrell of the St. Cloud Times,sdickrell@stcloudtimes.com telling about Ruth and our priests in Central Minnesota. The only clarification I would offer regarding the “requirements” stated below is that a strong sense of God’s call to the priesthood and the call of the community are a given and a Masters’ degree in Divinity or its equivalent is expected of those under 55 while for those over 55 a Bachelor’s degree in Religious Studies or its equivalent is expected. In terms of history/herstory of the Movement, it began in June of 2002 with the ordination of seven well prepared women by a Roman Catholic Bishop with Apostolic Succession, on the Danube River in Passau, Germany. The Movement came to the USA in July of 2006 when several women were ordained in Pittsburgh. My own ordination was in July of 2008 in Boston and now there are over 220 of us world wide- and many in preparation. As noted below we are validly ordained but contra legem, against man made church law. We congratulate Ruth for her courage and conviction and life of service as she becomes a priest today. That’s how three Central Minnesota women feel the Roman Catholic Church views them. That’s one reason Deacon Ruth Lindstedt chose to be ordained as a womanpriest Sunday. Lindstedt, 72, joins 220 Catholic womenpriests worldwide, including the Rev. 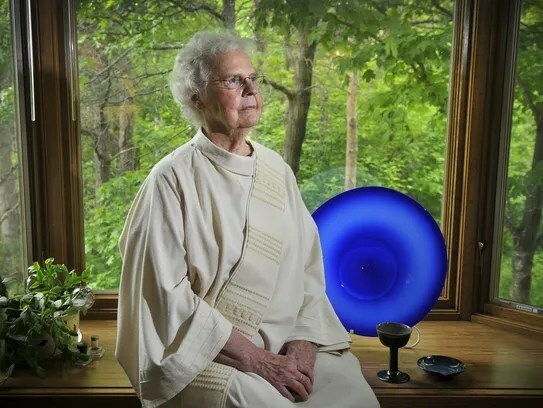 Bernie Sykora, 83, who in 2013 became the first womanpriest ordained in Central Minnesota. Both women live in Sartell. The Roman Catholic Church has stood in staunch opposition to the ordination of women for centuries. “They don’t know what to do with us,” said Rose Henzler, 72, of St. Cloud, who hopes to be ordained in 2017. For these three and others, it’s an issue that goes beyond their personal call to serve. It’s a pursuit of equality. Minnesota is one of the areas of the country that sees more support for the movement, said Jennifer O’Malley, president of Roman Catholic Womenpriests-USA. With Lindstedt, there will be five in the state. O’Malley, who lives in Long Beach, California, was ordained in 2012. For these women, the church’s position on women stands in opposition with its stated mission. “When the church talks about welcoming the marginalized, and this whole thing on justice, I’m sorry I just can’t take it seriously, folks,” Lindstedt said. Their ordinations are a form of peaceful protest. “From Mandela to Thomas Jefferson to Martin Luther King, (if there) is a law that is unjust, we must try to change it. If we can’t change it, we must break it. That’s pretty much where womenpriests are coming from now, on the side of justice,” Henzler said. They recognize that it can be difficult for people to accept. It requires a change in their worldview. “I know that members of my family who don’t agree with me are afraid that what they believed all their life is not true, that there might be some other way of looking at something,” Sykora said. Despite their drive to serve their community and faith, these women are taking risks with their social and their spiritual lives. Sykora’s brother, for instance, isn’t supportive. She spoke to him recently. “I said, ‘You know I’m priest,’ and he says, ‘No, you’re not,’ ” Sykora said. “It is very hurtful. In fact, I feel hurt by the church. Upon receiving ordination, they are automatically excommunicated from the Roman Catholic Church. In 2008, the Vatican Congregation for the Doctrine of Faith issued a penalty of excommunication for any women ordained as priests or any clergy that ordain them. The order is automatic and takes effect at the moment of the offense. Excommunication is the most severe penalty the church doles out, barring people from all sacraments, including communion. While this is concerning to them, women in the movement reject it as a punishment. “The call to priesthood, the call from God, trumps that unjust law,” O’Malley says. In recent years, the RCWP has reached out to church organizations like U.S. Catholic Bishops to talk about the issue, but generally, they don’t get any response, she said. Women in the priesthood movement have not received any indication that Pope Francis would make any changes. While the organization appreciates Francis’ tone emphasizing mercy, members will continue to challenge him to address the women’s issue in the church, O’Malley said. “Until he does, he’s not really addressing poverty and climate change, as women are disproportionately affected by all those issues,” she said. The Women’s Ordination Conference had an event in Philadelphia in 2015, around the time Pope Francis visited the area. The church’s stance on women can have global implications, members say. The Vatican has a seat at the United Nations. It’s a very influential voice throughout the world, O’Malley said. “We saw that with Pope Francis on the environment, the conversation that spurred and impact that it’s had. Imagine if Pope Francis said sexism in the Catholic Church is ending and … the church will be open to women,” she said. Despite the unmoving position of church leadership, there is growing support for their cause, O’Malley said. She hears anecdotes and conversations confirming this, along with polls and surveys. According to a 2015 Pew Research Center Survey of U.S. Catholics and Family Life, many Catholics, cultural Catholics and ex-Catholics think the Catholic church should change its position on allowing priests to marry and women to be priests. However, fewer believe these changes will actually take place in the next few decades. “We’re also seeing a steady growth in women who are answering that call to be priests,” O’Malley said. “As people find out about us, they’re really excited. The reaction we generally get is, ‘It’s about time,’ or ‘Why not?’ ” O’Malley said. For younger generations, it’s almost a nonissue. They assume equality is the way the church should work. The three local women have received support from some in their families, including children. Lindstedt says her children are spiritual but not religious. “What fascinates me is that now I’m taking this step … I called each one of them and said this is happening, here’s the date, and they said, ‘Oh, yes, please we’d like to be there,’ ” Lindstedt said. Her kids will travel to St. Cloud from the West Coast, just to attend the ordination. Sykora’s sisters and children are also supportive. The decision to seek the priesthood is not made lightly. Women in the movement talk about it as a calling to serve God and their community. They also feel called to create equality and leave the world better than they found it. Not every woman who’s interested in religion, religious studies or theology is called to be a priest. “We really think that God is calling us or our spirit is calling us to be priests, and we can deny or we can accept. For me, I couldn’t deny it. I knew that this was something I must do … to be who I was called to be,” Sykora said. And they dismiss the argument against ordination that relies on tradition. “I don’t care what they did two decades ago. I don’t care that women weren’t priests two decades ago. Anyone who uses that as an excuse is mind boggling,” Sykora said. “Tradition takes over instead of the possibility for true inclusion and love,” Lindstedt said. Still, as she approached ordination, Lindstedt considered her position. “I even wavered during the course of studies,” she said. But it’s not all about the job. It’s about changing your perspective. Womenpriests have to reshape their thinking, she said. Many in the womenpriest movement see a correlation between the Roman Catholic Church treating women as inferior to men and how society treats women, Sykora said. “That is so offensive, so sad, so hurtful to me, to think that something I have honored all of my life, and appreciated so much all of my life, now is guilty of some disrespect to a group of people,” Sykora said. And it’s such open disrespect that it validates those actions in others. “They’re not giving an example of equality and honor and respect,” she said. The Roman Catholic Womenpriests hope to build the movement where the church is forced to deal with the issue. 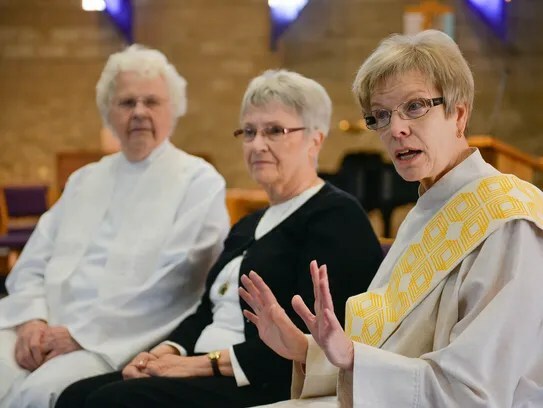 “(The church) won’t be ordaining womenpriests until women are ordained,” Henzler said. But they don’t want to stop there. They believe the whole church needs a renovation. One way is to change the language that is used. It should be inclusive, using pronouns such as they or their, not exclusive, such as him and his. There are also so many connotations of God as being male in scripture and tradition. In the Orthodox and Roman Catholic Church, Sophia, or Hagia Sophia meaning Holy Widsom, is an expression of understanding for the third person of the holy trinity. It is a feminine image. 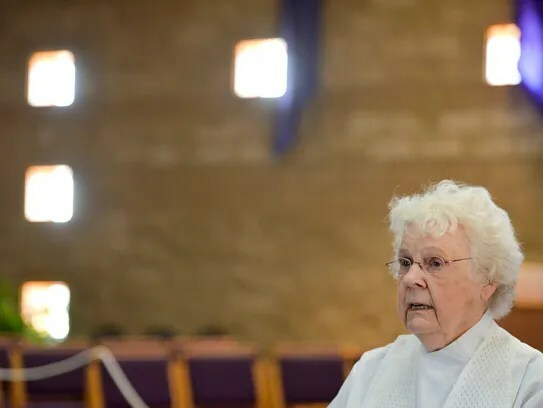 “When you go to a church where there’s a male giving the homily … the woman experience has not often been talked about in a personal way, as it can be by those who have experienced it,” Sykora said. For example, some of the scriptures describe God as the tender mother. “And it’s been so ignored by our male hierarchy,” Sykora said. As an organization too, they quite literally try to practice what they preach. Their approach is based on circles of relationships, or consensus-building. There isn’t a strict hierarchy. Yes, there are bishops, who are servants and leaders. But they’re not unquestioned decision makers, nor do they have authority in judgments, Lindstedt said. All of this is a process, of course, one that accounts for varied viewpoints. For instance, the movement doesn’t take a stance on particular issues. People as individuals can decide but the group would need consensus to make a statement, which is difficult to achieve. But generally, there’s a degree of openness, Lindstedt said, on issues such as divorce and remarriage, LGBTQ, abortion and more. And if beliefs seem to come from a place of bigotry, hate or distrust? Lindstedt said they are challenged to see beyond that to the individual and try to understand where it comes from. “We need to be loving to that person,” Sykora said. To understand that hatred is coming form someplace, Henzler said. Maybe it comes from a place of fear, hurt or an experience. There’s always a why, she says. “I would say that I know that I am still learning about how to love more, how to listen more and allow my heart to expand more,” Lindstedt said. “So if a person is coming from a place of hate or exclusion, rather than reacting, … I need to learn more about being more loving. The women find fulfillment in their service. Sykora lives in senior housing. She doesn’t say Mass at the altar because she doesn’t have the energy for it. “But people in the community know I’m a priest and they respect me for it. And I’m involved in the community in a different way than if I wasn’t a priest,” Sykora said. People come to her for advice. For Lindstedt, the symbolism of the liturgy itself is so dear to her heart. “To be able to take a role … in convening people, to join in this celebration is really important, Lindstedt said. The women ask each other an important question: If you were invited back to the traditional church, would you? Lindstedt and Henzler would, but Sykora would have a hard time. “This presumes there’s some healing in other areas as well. Not just women standing at the altar, but acceptance of the fact that there is an inclusive welcoming of all,” Lindstedt said. Henzler would need to see drastic changes. It’s imperative, they say, for the church, the community and individuals to grow. “It’s a matter of a community effort growing to be something that is God-like,” Sykora said. Sykora said while considering ordination, her age was a factor. She wondered, was it really worth it? But she decided her ordination could be empowering to other women. “I never thought of myself as a feminist, however I’ve come to recognize more and more, to be a woman, it’s an important contribution to the needs of the world,” Lindstedt said. “Until women are fully incorporated into all aspects of life — and I don’t care what culture we’re talking about — then we will not see further progression in terms of peace, justice,” Lindstedt said. There are 220 women worldwide have been ordained as womenpriests. There are 16 women in a seven-state Midwest region are ordained. There are 11 women in the region who are in discernment or who have started the process to become a womanpriest. 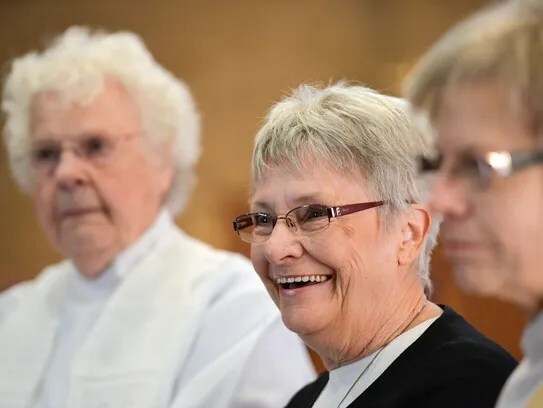 Ruth Lindstedt is the fifth womanpriest in Minnesota. There are five womanpriest regions in the U.S., each with a womanbishop elected by those in their region. Master’s in divinity or the equivalent. Complete 10 units through Roman Catholic Womenpriests, on subjects such as liturgy, counseling and the sacraments. They are online courses. Have a mentor to help guide through the process. Ordained as a deacon before moving toward priesthood. It is not required that you be a woman. While the goal is to ordain women as priests, there are men that have been ordained in the womanpriest movement. Roman Catholic Womenpriests asserts that ordinations of women are valid through apostolic succession within the Roman Catholic Church. Apostolic succession is the uninterrupted transmission of spiritual authority from the Apostles down through successive popes and bishops. It is important in Catholicism, but not in Protestant religions. As the first womenpriests were ordained by Roman Catholic male bishops, the group says that the ordinations are valid. Womenbishops too, have been ordained by valid Roman Catholic bishops. So anyone they ordain continues the line of succession. Source: Roman Catholic Womenpriests, Encyclopedia Britannica. 2002: Seven women were ordained on the Danube River. 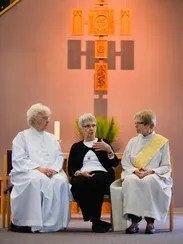 2003: Three womenbishops were ordained. 2008: The Vatican issues an Excommunication Decree, saying women priests and the bishops who ordain them are excommunicated latae sententiae, or sentence already passed or automatically. Womenpriests reject the penalty, because it relies on discrimination against women. 2008: The womenpriest movement comes to the U.S.
2009: Mary Magdalene, First Apostle, is formed. June 2013: Bernie Sykora is ordained as a womanpriest. April 10, 2016: Ruth Lindstedt is scheduled to be ordained as a womanpriest.